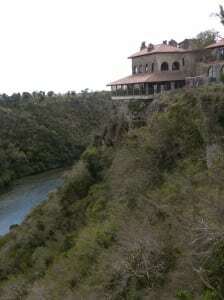 above the Chavon River, featuring crafts unique to the region. Colorful displays of hand sewn cloth dolls, or live Dominican dolls in shell bikini tops offer photo ops. A Romanesque amphitheater hosts entertainers from Sinatra to Sting. The river scenery below the stone magnificence is just as striking with cows grazing like tiny Fisher Price barn toys. The river runs alongside the Dye Fore Chavon nine. So aptly named, this course is a breath of fresh air to die for. 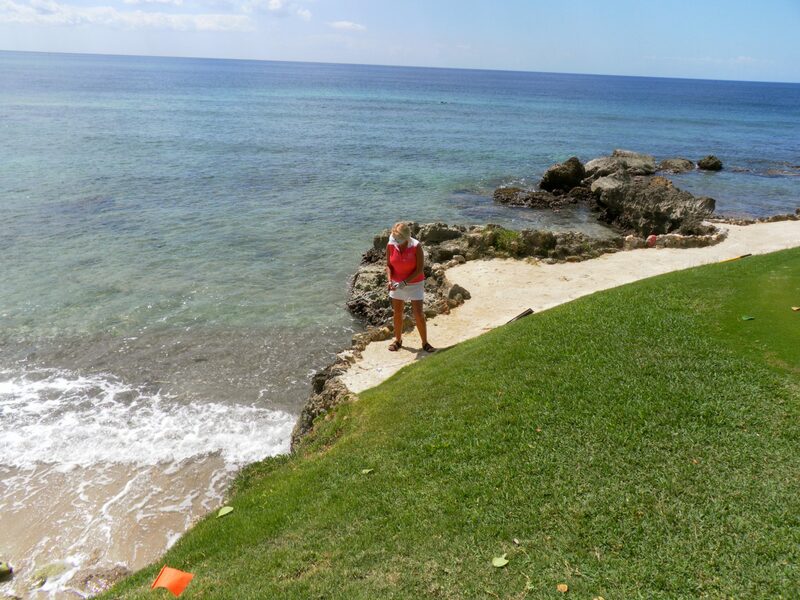 Here you are in the Caribbean, anxious to play those ocean holes on Teeth of the Dog (wait for it), but absolutely astounded by the layout of this rigorous up, down, and all around fun nine. At the turn, the restaurant serves great fare as well as the Chavon River focal point. Forward to the Dye Fore Lagos nine, meaning lakes, all intricately laced with rocks, variegated succulents and ferns. It is devoid of housing, unlike the Dye Fore Marina nine with views, naturally of the marina, but also sprawling homesteads uniquely architected, creatively and impeccably landscaped. 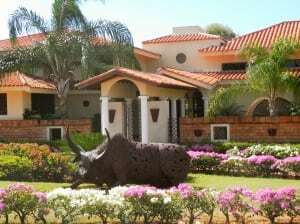 Golf meets “Homes of the Rich and Famous” on this fabulous course. Speaking of famous, Marc Anthony, Shakira, the Kohlers and Michael Jordan among others, arrive without fear of paparazzi. After our round at Teeth of the Dog (wait for it), “The Mechanic” Jimenez teed it up while Yankees’ catcher, Rick Cerone shared a drink at LaCana Bar & Lounge where live music calls for Merengue in the evenings. Can’t dance? The lovely young escorts of both genders are happy to teach. Ay caramba! The muddled mojito gets our high five, delivered poolside, or at Playa Minitas where a wall of sea rocks form a natural enclosure by the creamy sand beach for all the aquatic activities – snorkeling, windsurfing, sailing, paddle boarding and kayaking. Paddle boarding activated all muscles while providing comedic relief as the waves and wind challenged our maiden voyage. It looks so easy and probably is when you get the hang of it. The sea claimed a pair of sunglasses during one fall but only momentarily as they were easily spotted in the clear water along with tiny brilliant blue fish. We checked off snorkeling without donning a mask. Exhausted, we relaxed to the sound of gentle lapping waves and echo of voices repeating, ”The water is perfect.” It really is. Ready waiters cater to lounging sunbathers. 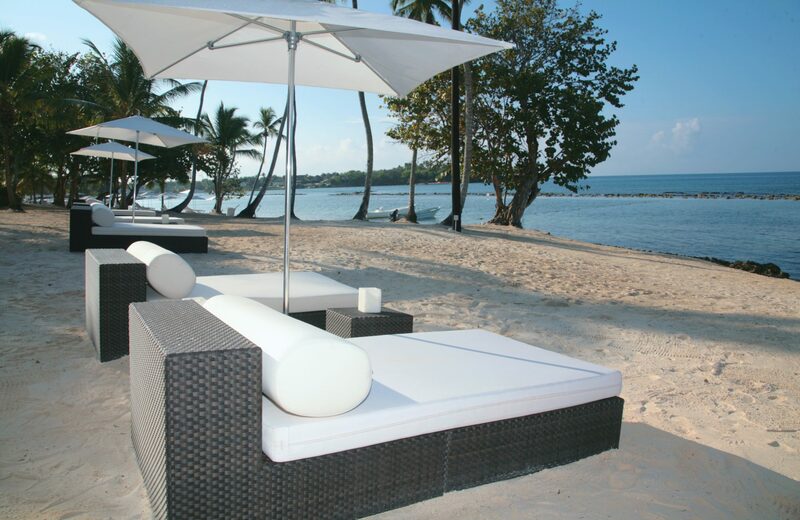 There is no wanting for food or drinks with eight available restaurants throughout Casa de Campo. Inclusive packages are recommended to fuel all rounds, the next perhaps being The Links, shorter on distance but long on personality. 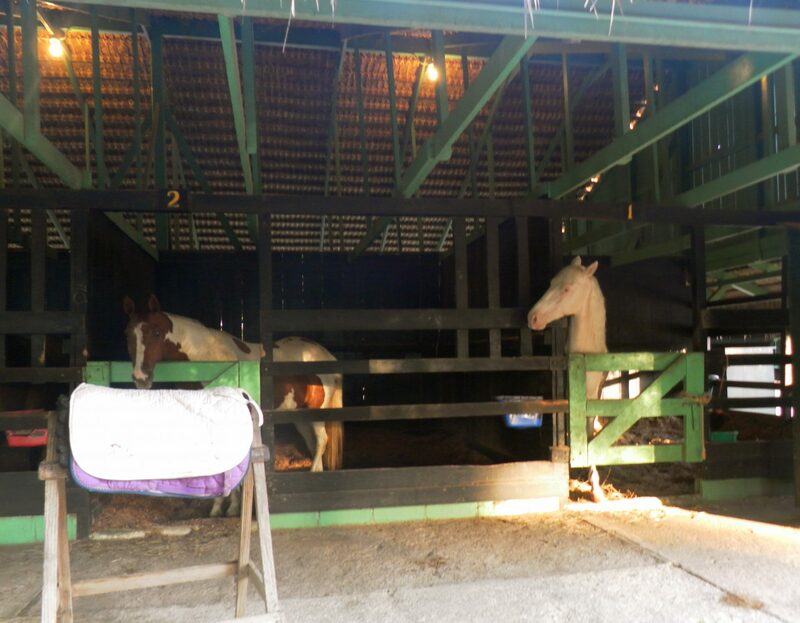 Save some sporting time for the Shooting Center and learn the truth about gun fun, then check out the Equestrian Center, both a dude ranch and polo club. Play or watch traditionally on horseback or donkey back, like donkey basketball games of yesteryear. over the sea but the ocean becomes so enticing, it is tempting to go for a dip, perhaps seeking lost balls! The distraction may yield some ugly golf shots but the camera shots are superb. 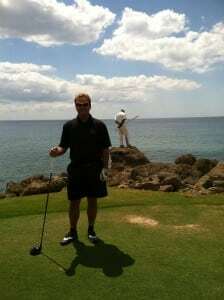 Shake off any bad scores or the dog might still nip at your heels as the ocean holes continue. No words can do the 18 at Teeth of the Dog justice. It must be experienced personally. 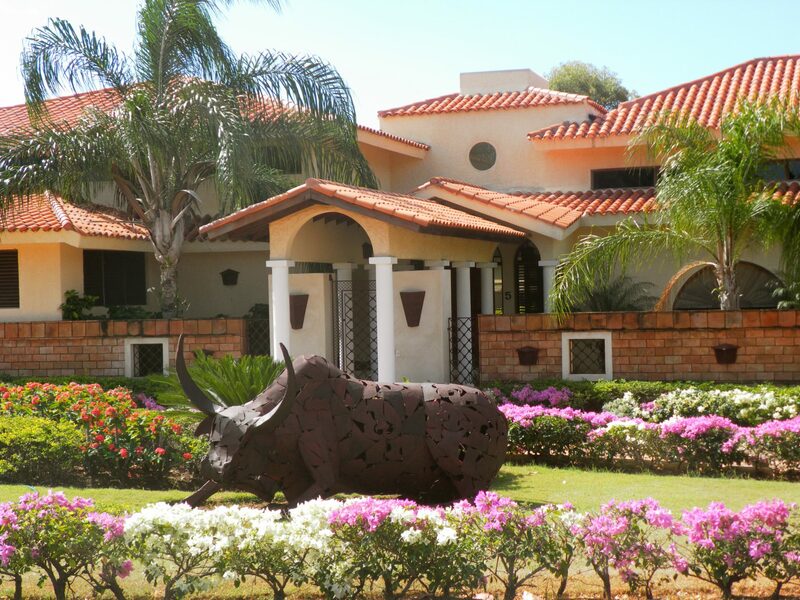 The bark really is worse than the bite, so select one of three airports and a package at http://www.casadecampo.com.do. 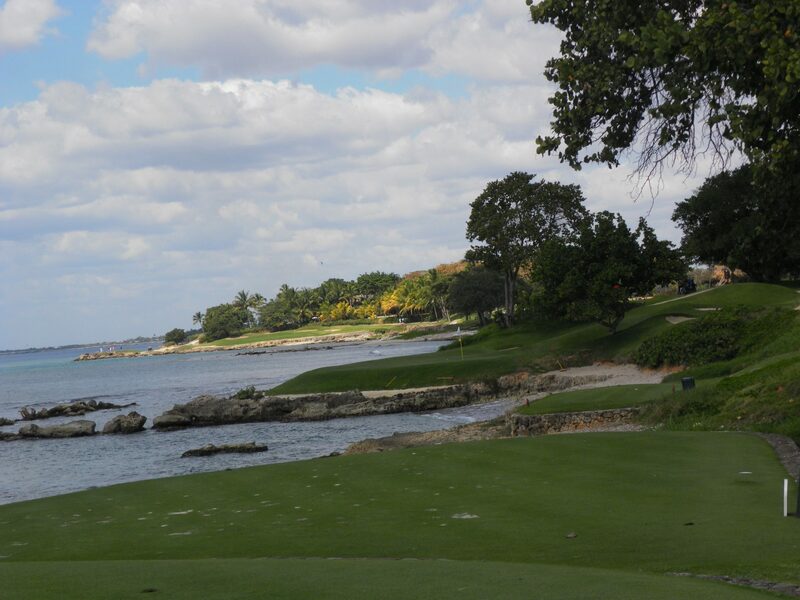 Fly into Casa de Campo to be bitten and smitten.